Everything was set and I awoke for the trip out to Nebraska for Odin's Revenge at the comfortable hour of 6am. Not so my traveling companion, The Bonk King, who had to get up at 3am to drive to where I was from the suburbs of Chicago. He arrived a wee bit late due to a traffic incident involving a burning semi tractor-trailer rig which blocked his passage for about a half an hour. No worries though, as our rendezvous with Mike and Amy, who were the couple that were ultimately going to be portaging The Bonk King and I with all our gear, were running late anyway. Once we made contact with Mike and Amy, we were busily loading gear up and chatting excitedly about Odin's Revenge. The Bonk King had never been to Nebraska, so he was extra excited to see what it might be like. We regaled each other with tales of riding and more as we trekked South and West towards the Western Plains. We discovered that my bar tape was being worn through, so Mike made an impromptu patch at a refueling stop. An interesting script on this fire truck. Not sure I'd want them putting out my fire! We decided to make a pit stop in Lincoln, but before we arrived, I had texted my buddy, MG, to ask for some gluten free dining spots in the city, as Amy is gluten intolerant. We were directed by MG to check out the Bread & Cup, so that's what we did. It turned out to be a wonderful suggestion, and we all enjoyed the experience. But we had a long way to go yet, so we got back on the interstate and Amy throttled up the Ford and made great time to Gothenburg, where we were to check in at the KOA Campground just outside of the town. The DSG crew getting folks checked in. We arrived late in the afternoon and we made new acquaintances and re-connected with old friends. I really like this aspect of events like Odin's Revenge, which are always part gravel/back road adventure- part reunion of old friends. It is hard not to spend a lot of time just chatting up folks! We got checked in, but we had to scoot over the interstate and check into our motel, download our gear and bicycles, and then come back later for the pre-race meeting, which was to happen at about 7:00pm. The Bonk King and I were to shack up in one room and Amy and Mike, of course, had their own room. It's always a bit comical when I go anywhere with my bicycles and I wheel them right into the motel. Most folks wouldn't give a second thought to leaving their bicycles outside for the evening, but then again, most folks don't travel with such expensive gear. So there are always "the looks" that one gets as you wheel your bike across the lobby and into a waiting elevator. The door to our room was right below this sign! Our accommodations were really nice, but the door to our room was right below the "Ice & Vending" sign, which made us wonder if we were going to get a lot of noises during the evening, or a random knock on the door. Fortunately, nothing of the sort happened all weekend. We were all settled in, and it wasn't time to head over yet, so we just chilled for awhile and chatted about the coming event, rain possibilities, and where we might be dining for the evening. The highest concern was with weather. There was some question to whether we would get to ride the originally planned for course since there were a lot of dirt only roads in it which would be made a mess by rain. The final word would be given at the rider's meeting. We sauntered over to the rider's meeting and there was already drips falling randomly from a grey sky. Radar showed a cluster of thunderstorms bearing down on the area. Chad Quigley, one of the heads of Odin's Revenge, called the meeting to order. He went over the conditions of the course and said it was up to the long course riders whether we should go for it or no. With (almost) one accord, there was agreement that we should buckle up and head into it as it was planned for. There was one, minor but very notable, exception. We hung out for a bit afterward, talked to a lot of people, and drank a few awesome craft beers from Nebraska brewers. Then, since I was so busy jabbing away, The Bonk King, Matt, and Amy left to go eat and made a deal with MG to bring me over later when I was done being social! We caught up with them at the local Mexican restaurant where I had a "Manny's Burrito" and more good conversations. Much comedy was made from the bloke's outburst at the rider's meeting which was to be a continuing theme throughout the weekend. Look for The Madness Part 2 tomorrow! Will it be too muddy at Odin's Revenge for this? Well, this is it! I have left, most likely by the time you've read this, for Odin's Revenge taking place near Gothenburg, Nebraska. There is still a question as to exactly what the course will be depending upon rain events. If they happen, word is we'll be doing two laps of a shortened course. As of Thursday, the course was still dry and rideable. What happened overnight last night and what may happen tonight will have a big effect on what course we end up doing. I'm okay either way. I am looking forward to riding anything we can out there and completing whatever course they decide upon. The rig is dialed in, the clothes were packed yesterday, and travel is happening now with good people. Odin's is going to be tough, for sure, but I feel as good as I have ever felt going into any event. I've done some work and now it is time to see if it will pay off. I'll admit that I did some silly stuff last year that I am not going to plan on doing this time. The temperatures look to be reasonable this year, so with a good pre-race regimen I should have my best chance of a finish I can get barring something beyond my control. There will be a report on the goings on, as I always write up, starting next week on Monday. Trans Iowa Masters Program course. This day marks the start of Steve Fuller's TIMP ITT attempt. This one is a solo, "time trial" type attempt at the route to set the fastest unsupported through-ride of the 377 mile route. Steve is a two-time Trans Iowa finisher and has finished other gravel events as well. He's got his work cut out for him this time though, since the course has been rained on and it is "front loaded" with most of the routes B Level Maintenance roads. (Read: Dirt- no gravel, lots of mud.) Rain is covering some parts of the Western end of the route and more may occur before Steve gets all the way out of that area. Follow Steve's progress on his SPOT Tracker. It updates every 10 minutes and Steve started this trek at 5am this morning. Bontrager will also have tires and rims meant to go tubeless together. I cannot believe that Specialized won't do the same thing. I look for a Roval branded rim from them soon. Of course, there are tires coming down the pike as well for all of this stuff. Fat bikers will rejoice for sure. Interestingly, I mused about what effect this may all have on Surly/45NRTH and I saw someone that runs a shop remark on this same thing on a public forum yesterday. The word was that QBP lowered their fat bike tire prices across the board on Surly tires "since the molds had been paid for now". Uh-huh. Conveniently so, on purpose or not, I think. But either way, that's a refreshing change to see happen these days and bodes well for fans of Surly's tires. But the whole point is that things are shaking out now which we were only dreaming of two years ago. Fat bikes are finally catching up and becoming "mainstream" in terms of the technology, and this will only be a good thing going forward for fans of the fattest tires. Okay, that's a wrap. Go for a ride. ya'all! Summer doesn't last forever! Scott "Big Ed" Fatbike: This will get to be a common theme for 2015- More companies entering into the fat bike market. You thought last year brought out a ton of new entries? This year I expect a lot more new bikes in the marketplace. This one is going to be a common theme- Rock Shox Bluto, aluminum frame "designed more for trail riding", (read: Not Just For Sand & Snow! 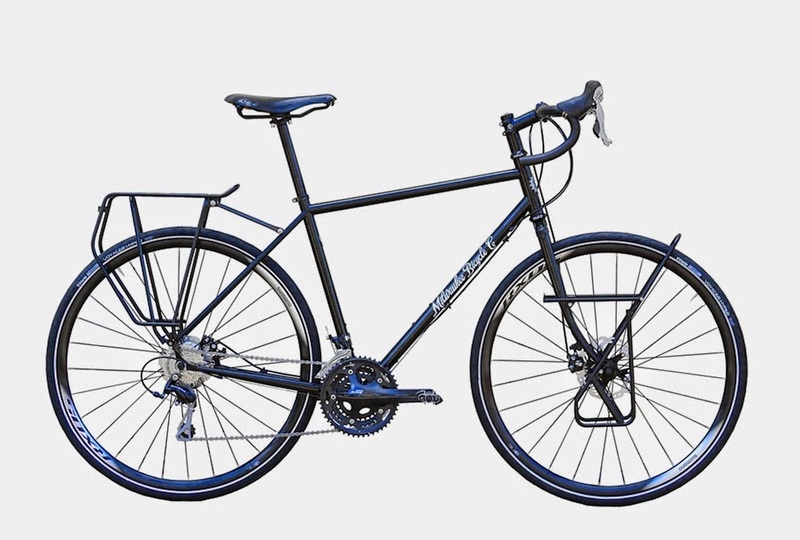 ), Non-Surly tires and rims, and $2000-$3000 price points. This particular model is interesting for the fact that the rims are branded Syncros, (a brand Scott Sports owns), and the claimed 4.5" wide Kenda Juggernaut tires. Interestingly, Scott went with the 190mm rear axle, so there are going to be a mixed bag of axle standards out there. My money is on the offset 135mm rear fat bike standard going away with 170mm rear and 190 rear based frames staying around a while. (Add a bit of width for through axles on either one, but those are based on 190 and 170 Quick Release Frame dimensions.) Claimed weight for the Big Ed, (purportedly named for Scott's founder), is 33lbs. Cruising the Twitterverse, I saw this teased by Ben's Cycles, the online shop that is home to the Milwaukee Bicycle Company brand. Apparently, they are working on a part touring, part gravel road riding rig. Seen here in full, you get a tiny taste of the Fugitive in touring mode. It's hard to say if this is all "Long Haul Trucker" or really a "gravel rig with racks". I'm going with the touring bike angle here , but you never know. 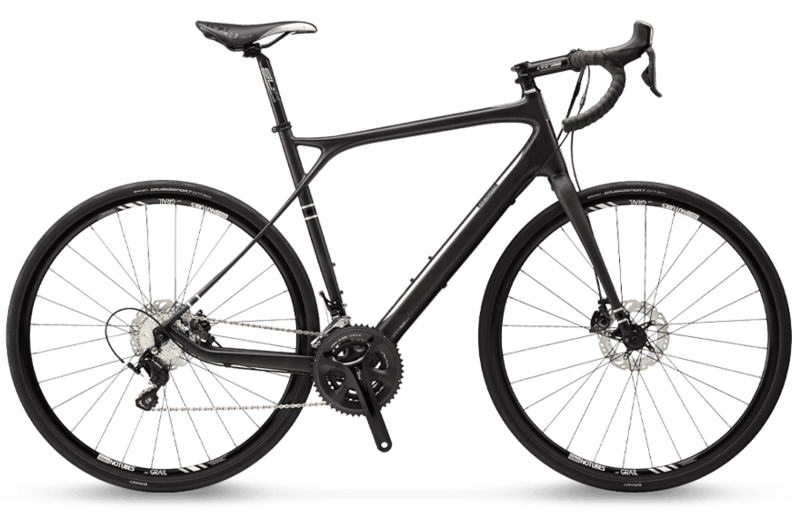 All Ben's are saying now is that this is "a bike engineered for gravel and touring." So......like a Bruce Gordon "Rock & Road" bike then? If so, it should be a great steel frame set to build an off-beat gravel rig from. I don't know if anyone has really considered this, but with the ability to fit larger tires on many of these "gravel rigs", one could tour on "any road", which really gives you a lot of options, instead of being limited to pavement. I like that kind of thought myself. Hopefully there is room for big tires and fenders. That would likely keep the dust down off the drive train and whatnot. Salsa tandem as seen in 2013 at Frostbike. I figured that Salsa should do this tandem back then, because I think it is a hole in the marketplace that they stand to fill in nicely. You have Santana, CoMotion, and.....and..... Yes there are a few small tandem specialists, but try finding one to look at, or even better, to test ride. This was found on Facebook.....hmmm. So cruising around on Facebook recently I see the same, (or so similar it is uncanny), bike in a different color with Alternator drop outs and all. In every image I've seen of this, (yes- I've seen it posted several times), it is always with the foam shipping protectors over (presumably) the logos. My guess is that Salsa Cycles is finally ready to bring this tandem to market and that is why the logos are covered. I cannot imagine it being anything but a Salsa, since the Alternator drop outs are pretty much a dead give away on the identity of the brand here. Also obvious is that this has its own fork now, which I am sure was a challenge to design and to get it to pass the rigorous testing protocol that Salsa subjects itself to. The only thing left to the imagination here is what the name really is and how much this will sell for. In my view, Salsa stands to gain some market on the tandem side if the price isn't stratospheric and if it has the right features. 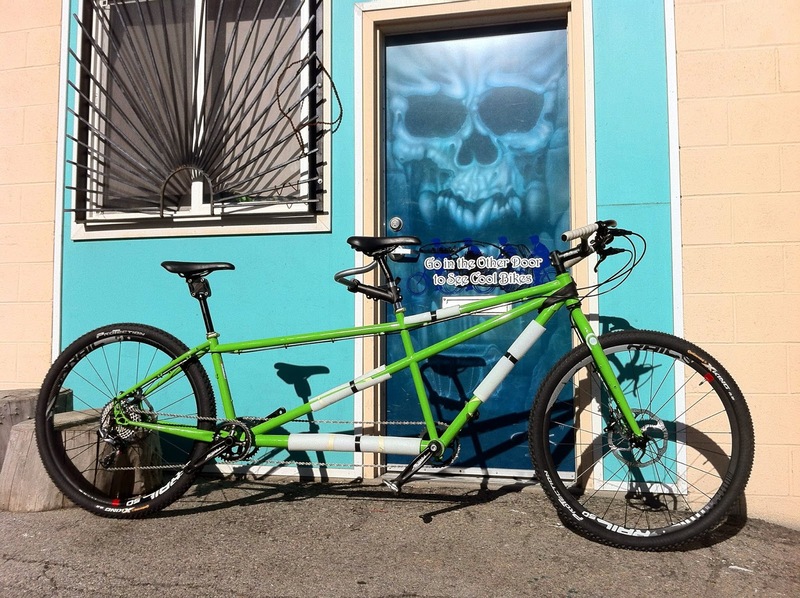 Yes.....if it is sold as shown it is an "mtb tandem", but you do realize that smaller tires can be fitted, right? Not everyone wants or really needs a drop bar racing style bike, which is what most high end tandems are now. 45NRTH had to get this done, and I am glad to see it. The prices for the tires are reasonable, and the carbon rim should be nice, so this brings something to the table that Salsa Cycles and Surly Bikes might be able to use to bring their fat bikes into the 21st Century in regards to tire technology. The upcoming Bontrager system will be a competitor, and perhaps one or two others will crop up yet this Fall. 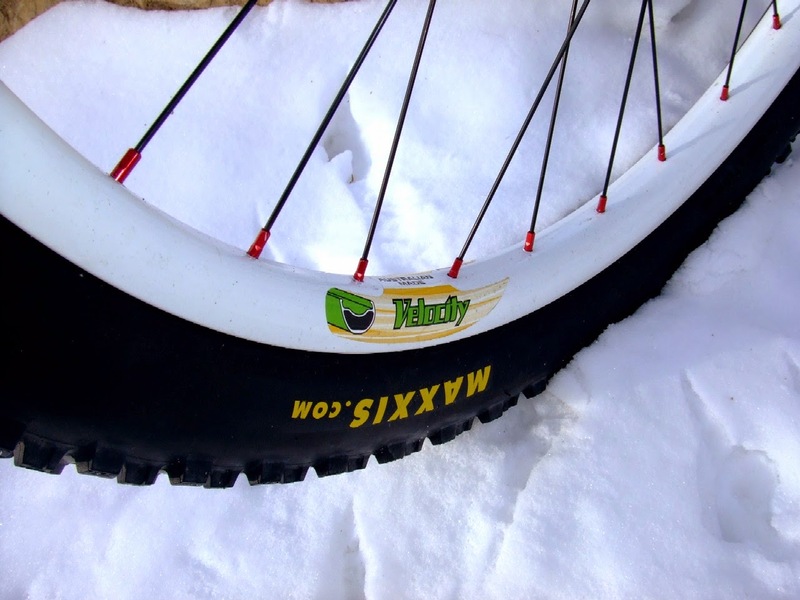 Things are getting interesting on the tubeless fat bike tire market! A couple of years ago now I was just starting to assemble some stuff to go do a "sub-24" and possibly more on my Ti Mukluk. Then I ran into some road blocks. Some self induced, some not. Gear "paralysis analysis", "tyranny of choice" issues, and my wife going back to school all conspired to push me off course with that plan, and I decided to move in other directions. Now my son is old enough to make some shorter rides to do sub-24's and my wife has finished school. Not only that, but I decided to do more "jumping" and less "looky-looing" at gear. Some things have been sorted that have now brought me to the brink of really being "ready to go". Those things were major hurdles to me mentally two years ago, but now they have been put behind me. One of those things is my cooking kit. I made a pretty decent alcohol stove from a pop can last Fall, and then I picked up a nice titanium cup, stove stand, and wind screen about a month ago. Along with my Ti Spork and another folding titanium spoon, I have stuff enough to get my son and I out for an overnighter. My son and daughter are in there. Last week I picked up a two man tent. I had a bike packing tent, but it was more of a glorified bivy and it required a bicycle tube and wheel to make it stand up, which is a pain, and heavy to boot. I had all these wild ideas of getting alternative poles and what not, but in the end, it was just a dumb idea and my son wasn't going to fit in there either! This Seirra Designs Lightning 2 is perfect though. It isn't the lightest, smallest tent going, but it is simple, roomy, and has features I appreciate in a tent. In other words, it will get the job done just fine and it didn't cost me some enormous amount of money. Realistically- I am not going to be camping in cold, inclement weather, so ya know......I don't need this epic gear. I just need a decent tent to have some fun, right? We'll pack up his fat bike and one of my rigs and off we'll go to test our mettle over night someplace. We've also got a date coming up in July when we have to overnight for the NASCAR/Indy races at Iowa Speedway near Newton. So now we'll be ready, and we'll really be "ready to go" after all! Good ridin' folks are puttin' this one on. The Slender Fungus Cycling Association is going to be putting on this humdinger of a ride on the 29th- yes, that's this Sunday- in Jo Davies County Illinois, (J.D.- get it? ) starting from the Apple River Canyon State Park in the Northwest corner of Illinois near Wisconsin. It's starting at 5am because this ride is 150 miles, so not for the faint of heart. I suppose you could make an "escape route" if you cannot go that far in very hilly terrain, but this is a fully self-supported ride on gravel. These folks are pretty serious about doing the whole 150 in one large bite, and they are very encouraging of any that should be of like mind to join in the fun. The ride plan is to all go together as a group and not to leave anyone behind. (Caravan style) It's free, it's an adventure, and if you live in the tri-state area, you should check this out. Here's the linky for your viewing pleasure. Competitive gravel racing at the Iowa Games. Maybe 150 miles of self-supported gravel riding isn't your cup-o-tea? Well, then you're in luck, because Sunday also sees the 2nd running of the Iowa Games Gravel Grinder. It's a metric plus- about 65 miles- and you have age groups and medals, and t-shirts, just like a "real race" would. 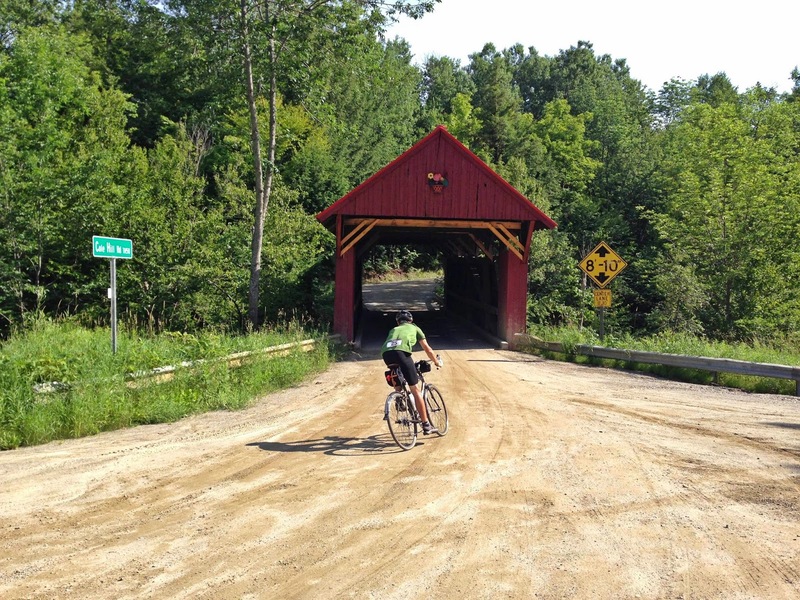 So if your competitive juices need stirring, and you like gravel roads, check this one out. Again, good folks are backing this one and there will be a few Iowans I know riding in this that are good people. You'd have a good time if you decide to go, I'm pretty positive about that. This one costs about $20.00 if you sign up real quick like. (They have on-line registration till tomorrow) It'll cost ya an extra fiver if you wait too long, and my buddy Jared said you shouldn't wait that long, so, ya know........don't wait that long! Right? Maybe you don't live in the Mid-West and think that you don't have any gravel roads to play on? Well, if you are anywhere near Vermont, you need to check out Raid Lamoille on July 12th. Again, a metric or so of back country roads, 80%+ gravel, and scenic as all get out. Oh yeah......6000+ feet of climbing. Which ain't too bad, when you think about it. I mean, we can give you that in Northeast Iowa, so it isn't like that is undoable or anything, right? Plus, this event has a marked and cue sheeted route with a freakin' covered bridge! And an after party? Really, you folks in New England have nothing to complain about when it comes to gravelly goodness, not as far as I can tell. So while I am "contemplating my madness" while pedaling my bicycle in Nebraska on Saturday, you folks out there could be doing something likewise. It's Summer, and the gravel happenings are going on all over the place. "Ya best be gettin' while the gettin' is good", as we like to say around these parts. It was maybe a month ago that I was still thinking we didn't have enough moisture around these parts. Heck, even last Sunday I was thinking the trails were really dry, and I had just ridden the "Bottoms" at Ingawanis for the first time. I won't be doing that again for awhile! How things change in a week's time! Now it is flooding and the Cedar River is getting close to a level I haven't seen it at since 2008 when we had an all-time record level flood here. This all means a couple of things for me and cycling around here. First of all, obviously I won't be using many of the dirt single track trails in this area. I'll have to travel at least an hour away to get to anything dry enough to ride anytime soon. Even if we weren't supposed to be getting more rain, and the trails were clear of water, the mud and debris from flooding puts off road riding into late July, most likely, at the earliest. Parts of Ingwanis may bounce back sooner than that, but it has to quit raining all the time first. Secondly, It means there are going to be a bumper crop of mosquitoes later this Summer. Standing water pools are almost a guaranteed fact now for the rest of this Summer. Perfectly suited for mosquitoes to hatch new younginz. It will be Fall before it gets any better in that regard, most likely. Then again, maybe I'll be wrong about that, but post the '93 and '08 floods, I recall the mosquitoes being particularly bad. A riverside bike path sign and guard rail nearly under water. Happy Birthday to my Mom today, by the way! That's probably a good thing since I need to buckle down and ride parts of the Guitar Ted Death Ride Invitational course to straighten out which choices I need to make to tie in Backbone State Park into the route so folks that want to can camp. I did a preliminary route idea but it comes a few miles short of a hundred and I am going to do a modification to see if I can't bump up the mileage to over a century. Of course, the first order of business is to get through Odin's Revenge on Saturday, then I can concentrate on the GTDRI. Looking at the forecast, we've got a great chance at a dry spell, so maybe we'll luck out and dry up by next week and some of the trails will become rideable. I just don't think that will be much of a possibility though, even with seven days of straight up dry weather, since they are saying flooding will persist on through Thursday now. But.......ya never know! It was the Body Float seat post by Cirrus Cycles which I am going to be using so I can be finishing up the review for Gravel Grinder News later. I was pretty anxious to use it for Odin's Revenge, and since time was running short, and this likely my last big gravel outing before the event, I was needing that thing on my Fargo now! Fortunately, MG had the foresight to obtain the heavier springs so I could swap those out before the ride. I actually only did replace one, using an orange lower spring, and felt that this gave me a good amount of negative travel along with the ability to not be bottoming out. Well, with that sorted, I left about a half an hour later than I wanted to, but that was okay. I decided to try the same almost 35 mile route I used on Wednesday which precipitated the knee issue. I figured if I had another bout of knee pain, I wouldn't be that far from home and could limp back in. Of course, it was the "old reliable" Fargo Gen I, but there were major changes, so some things might not pan out here. Another good reason not to try to hit up massive miles, just in case something really didn't agree with me. Ragely Luxy Bars are really just amazing. Too bad ya can't get them anymore. Speaking of remembering things..... I ran out of the house in such a frenzy I forgot to try my Topeak saddle bag on there, (it fits fine, by the way), and with it, all my repair tools and tube! I also forgot my mini-pump. Good thing the tires are tubeless with "MG's Special Sauce" sealant, which has been dead reliable for me for several years now. The Ragley Luxy Bar.......what can I say? This is hands down the best off-road drop bar ever made. Best for gravel too, if you need lots of leverage and sweep. Others are "good" to pretty dang nice, but somehow this bar just ticks all the boxes. Perfectly swept, wide, shallow drop, and minimal reach. The unique 31.8mm diameter of the tops to the ramps is not just for looks either. It works, and without the typical taper, it allows for more and better places to mount things, or grip the bars there. The only other bars I would ever recommend for off road drops are the On One Midge and for gravel, the Salsa Cycles Cowbell. The ride went well, by the way. The knee was much happier during and so far- afterward, with the ride. I can tell it isn't 100%, but at least the Fargo isn't making things worse! Obviously, I like the bars, and what about the BodyFloat post? I have to bang out more rides, and Odin's will figure into this, but for now I have but two words for this. Puffy white clouds and miles of gravel. So it's settled then. It will be the Fargo for Odin's Revenge. The BodyFloat will be on-board, and the Ragley Luxy Bars are perfecto. I'm running Bike Bag Dude Chaff Bags again, which are indispensable for carrying food and water bottles. (Although with the five or six bottles I can run on the Fargo, I won't use them for water this year.) The Planet Bike Snack Sack will be where the camera lives with some other oddments like sun tan lotion, Vitamin "I", etc. Still left to figure out: Lighting, snacks, nutrition choices. Packing, and rendezvous with the Bonk King and Mike Johnson on Friday. Travel on Friday for seven hours or so, then we're on. Friday's little test session revealed that my knee was not 100% and I think I have diagnosed why. In my pedaling all Spring on "normal" bottom bracketed bikes, I have had several hours into strong winds. It has been that kind of Spring this year. I'm certainly no bio mechanical engineer, but it seems that stomping out the miles into the wind has refined my pedal stroke to work most efficiently with a narrower tread and not the wider stance of a fat bike's 100 mm bottom bracket width. My pedaling on the Ti Mukluk I think was where I got into trouble. My thighs and hips were trying t replicate the "efficiency" of pedaling my other bikes while my foot was outboard more and the discrepancy showed up in my right knee after two hours of hard pedalling into the wind on Wednesday. So, as I said, Friday I figured out that pedalling a fat bike hard was not going to be a good idea, and with Odin's 170 miles of challenging terrain, I bailed out on the titanium Mukluk in favor of the Fargo Gen 1. However; I had to make some tweaks! I had already refreshed the drivetrain and replaced the 2X set up with a lower ranged triple crank. Last night I swapped the On One Midge Bar to a Ragley Luxy Bar, re-taped the bars, and went for a test ride. This will be much, much better on the knee! Back when I proposed the Trans Iowa Masters Program idea, I figured that some folks would give it the cursory, "oh....that's cool", and then that would be it. You know- no one was really going to be excited about this idea. Once again, I was proven totally wrong about that. In fact, not only was I wrong, but two fellows have already successfully navigated the entire process. They rode the course, wrote up their individual tales and submitted them with photographs. So, I had to own up to my promises after all! Here is the TIMP Ride Report site. Under the header you will see the two gentleman's names and you can click those to take you to their reports. It's good stuff, really. Also, I am sending these certificates of achievement out, which are mostly hand drawn, cause that's how I've always rolled. No, they aren't "perfect" and neither is TIMP or anything I put my hands to, so I think this reflects the nature of the whole deal. Obviously these are based off the design I came up with for the t-shirts for T.I.V10. I didn't simply just copy and paste that though, this is all new. Again- it's how I like to do things. In other TIMP news, the weather of late has severely flooded the Big Sioux River on the South Dakota/Iowa border, so the start line for the TIMP is not accessible at this point. When it will be again, I do not know, but the next scheduled ride is June 27th, so it may affect that starting point a bit. I have word that the rest of the route is unaffected, so that was good to hear. There is one more ride scheduled in July and I am hearing that another is pending. We'll see how many end up actually pulling the trigger on this, but it only runs through to the end of August, so time is limited. After August 31st, I will pull down all the info on TIMP located on the T.I.V10 site and it will not be offered again. The Ride Reports will be up on the other site I announced this week indefinitely. 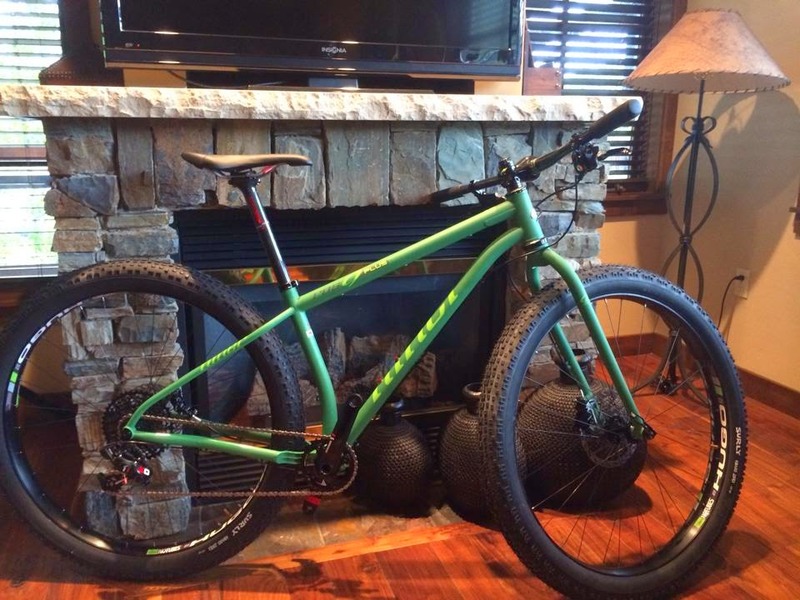 With the announcement earlier in the year of the long rumored Rock Shox Bluto suspension fork, the push to make a fat bike an "everyday mountain bike" is full on. Take a look here at this leaked shot of the 2015 Specialized Fat Boy Pro. 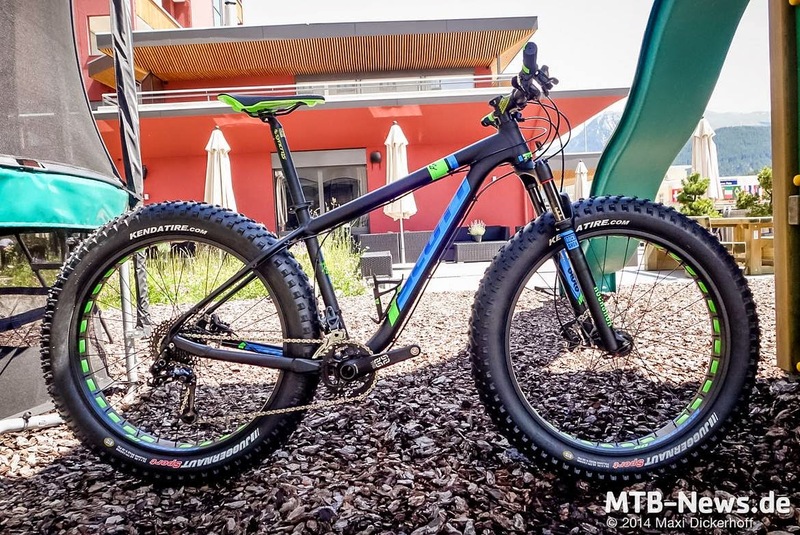 You can see a dropper post, and obviously, the original Fat Boy has a different geometry that promotes better trail handling, eschewing the previous fat bike grail of ultimate soft conditions stability. Now the rage is to get these bikes to be more playful and fun to "shred on" than the earlier fat bike types were. Wheels: While carbon fiber and materials technology is ever advancing to lessen the load we humans have to try to spin around on our bicycles, fat bikes will always have much heavier wheels and tires than any other mountain bike. How much "playfulness" and mtb shredability can be squeezed out of a fat bike will probably always pale in comparison to a "mid-fat" "plus sized" wheel, (think 29+ and the upcoming B+ wheels), and there will never be any comparison to "normal" mtb wheels in any of the three sizes still available. Price: To get closer to a lighter weight, more maneuverable mountain bike with fatter, 3.8"-4.8" tires, one will necessarily have to throw large wads of cash at the project. Could less money get you into a similarly shred-able mountain bike with slightly less corpulent wheels? I think that answer will always be "yes". However; having all this "trail bike" innovation is still cool, and I am liking what I see. I just don't advocate for something like this as being "better" than having a regular mountain bike, or that it is a mtb replacement. Surely, there will be many that go that route, but I think the vast majority of folks will see the "fat bike as trail bike" movement as a supplemental rig to their regular mountain bikes. That or replacement 700c wheels built on fat bike hubs that can be mounted with 29 X 3" tires will start to become a thing. I could totally see that. 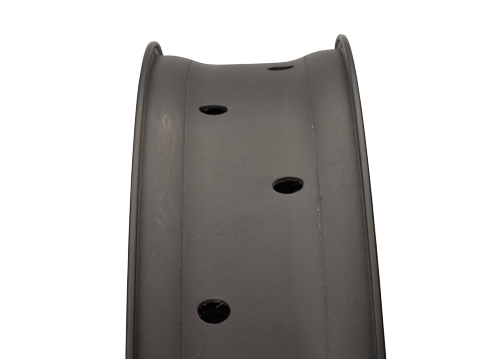 Fat bike tires for when conditions are soft, then swap out to the lighter weight, faster, mid-fat wheels for drier conditions. Walking up the stairs in the house Thursday morning, my right knee went sideways all of a sudden and I felt a sharp pain underneath my knee cap. I've felt a dull sensation there at times after riding the Ti Muk in its current form, and I figured it was likely the wider bottom braket raising a little cain with me. This is why I haven't tried clipless pedals on that bike, since I can kind of move my feet around to optimize my comfort in my joints when I need to. Being locked in would not allow for such tweakage. It's worked for me in three Triple D attempts and finishes and countless long rides outside of that. However; this Spring and Summer I've noticed a change in that and it has been just an annoyance and never has been anything even worth mentioning.......until now! The Fargo Gen 1 was used last year, and honestly, it was just geared too high, and that torched me out sooner than I probably needed to be, since I could not spin the cranks on that set up. It was mashing gears all the way! I have a triple crank on it now with much more reasonable gearing, and otherwise it stands ready to go as it is. I'm going to go for a short ride today, and if the knee starts to hurt, I'm cutting the By-Tor from the roster and going to go back to the Fargo Gen 1 rig. Stay tuned.......this could get interesting! Last time I mentioned that my cassette had come loose. Well, it is a SRAM 10 speed cassette and the shim doesn't work with that cassette on the Salsa hub, at least it wouldn't the other day. I got the lock ring to tighten down further, and everything seemed to be very solid. I threw it back together and did a couple commutes with it with no issues. Yesterday on my day off I decided to wait until the rain had been over for awhile before heading out. It was pretty humid, but it wasn't very sunny, with all the cloud cover, it was sort of odd. The wind was pretty stiff out of the Southeast, which were the two primary directions I was going to start out in as well- South and then East. That's okay if you make it to the tail wind section though! The roads were packed and not too wet. There was hardly any dust. The gravel was messed up, for whatever reason, and there weren't very many "good lines". It didn't seem to make much difference with the GEAX AKA's and I rolled everything just fine. It was just the wind, really. To give you something of an idea, it took me two hours to get to the halfway turnaround and an hour to get back home from there! There was nobody ho......right! The home is gone! So, a bit over three hours yesterday and it turned up two issues. One is a bit frustrating. I heard the clanging noises about the time I got out of the wind, so who knows how long it had been going on, but the cassette is loose again. Just slightly loose, but loose enough to make noise. I'm just about ready to toss all my SRAM garbage and go with a complete Shimano set up. My feeling is that this SRAM cassette is goofy. The other issue is with the saddle. During the Winter, when I am doing shorter rides and am dressed differently, I guess I don't notice, but the Ergon saddle isn't doing the trick after a few hours. Maybe it's too wide, (I think this is the trouble), or whatever, but it is too close to Odin's to do anything with an untested saddle. That is why the Ti Muk s getting the WTB Pure V off the BMC for the time being. That saddle I know and it is comfy. Maybe when Odin's is over I will look into something different for the Ti Muk so I an put the Pure V back on to the Orange Crush rig. The last thing I need to do is get some bar ends on this rig. I really need some different hand positions! I may have some old Ergon stubbies around, but the shop also has BioKork grips with the longer "L" shaped bar end which might prove to be the best bet. I've gotta get this dialled in a few days because next week is the run up to Odin's and a week from Friday we're off to the hills of Nebraska! News Season: Part 1 Fat & Gravel- Get Used To It! It's Summer and like last year, I am going to sling out all the new bike entries here that I find interesting, and there are already a bunch of interesting things hitting the digital screens out there. The buzzword last year was "enduro" with a sprinkling of fat bike and gravel stuff. This year, enduro takes a back seat to fat bikes, "plus sized rubber", and gravel oriented stuff. Get used to it, cause there's gonna be a lot of news in those categories this Summer! Over the weekend the news broke about GT Bikes new "Grade" model line up of "all road" bikes. Yes....they used the term "gravel bike". You decide what that means to you, I already have a pretty solid opinion of that. Anyway, this rig doesn't have the bigger tire clearances that many die hard gravel road aficionados will desire. Up to a 35mm tire, but it does have some cool design elements with the solid, glass core wrapped in carbon fiber seat stays, (yes- solid seat stays. ), which reminds me a lot of fishing rod technology, to be honest. They went in for a pretty big line up of two carbon frame and fork models with three aluminum base line models as well. Niner announced a new carbon cyclo cross rig, which is okay. (I'm not all that into CX, so please excuse my non-excitement there) However; it was what wasn't "officially released" that was really interesting here. Niner's new ROS-9 Plus was spied by someone at PressCamp and the image quickly made the rounds on social media. What may be a "no-brainer" move by Niner was made even more interesting by the fact that the bike was shown with a new set of Stan's hoops dubbed "Hugo", which is a totally new design. Instead of the hollow, extruded section of the rim being underneath and bridging across the rim walls, as in traditional designs, Stan's newest hoops have the box section and rim bead seat all on the same plane, as it were, so that the outer appearance of the rim is almost as if it were a single walled rim extrusion. It's pretty clever, and the Hugo line up will go across three wheel sizes- 622ISO, 584ISO, and 559ISO. Width internally is just shy of 50mm, so these will be spreading tires to really wider footprints. Strength should be greater than single walled rims, and weights are said to be competitive with Velocity's Dually rims, which are currently the only double walled extrusion in a similar width available now. This shows me a couple of things: One- that 29+ is going to catch on with more manufacturers getting behind it now. Two- That "B+" is not only going to happen, but it will become a bigger deal, probably next year, and you're going to start hearing a ton about it. Real soon, in fact. I have been riding a mountain bike long enough that my first mountain bike was set up on "wide" rims. Araya something or anothers, as I recall, but they were maybe 25mm wide, outside dimension. Then shortly afterward I recall rim widths shrinking dramatically as the 90's rolled on to where there were rims being run on mountain bikes that were the same width as road bikes were running with 23mm tires on them! We had to run 50-60psi just to keep those tires from rolling off the rims! Of course, things swung back, but with the advent of fat bikes, it seems that, (whether fat bikes have anything to do with it or not, it seems all the wide rim stuff happened about the same time), it seems that all bicycle disciplines went in for wider rims. Road bikes got wider rims. Mountain bikes got wider rims. Even fat bikes went to 100mm rims. But it seems that the most extreme examples of rim width versus tire casing width is happening in the realm of 29 inch wheels. If you had told me five years ago that I would be riding a 29"er with 45mm wide rims I would have laughed out loud. Oh, there were a few outliers back then, like the trials rims some guys were trying, or Kris Holm rims for unicycles. However; I figured that wasn't going to go anywhere, really. Even when I got a pair of Sun MTX-33 rims, I didn't build them up, figuring that wide of a rim was overkill. But a few things began to change my mind. The joys of wider rims began to sink in with these Blunt 35's with Ardent 2.4" tires. 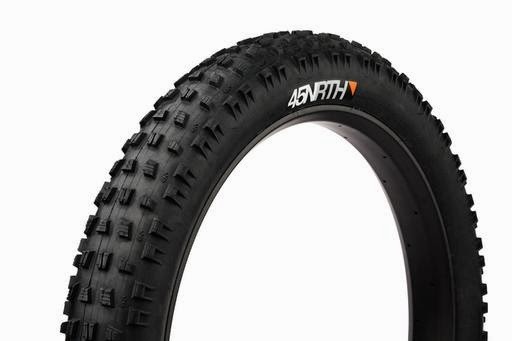 Back in 2010, I began riding on some Blunt 35's shod with tubeless Ardent 2.4" tires. I found that the footprint allowed for some "almost fat biking", and I actually could stay up on top of some crusty snowmobile trail at times. 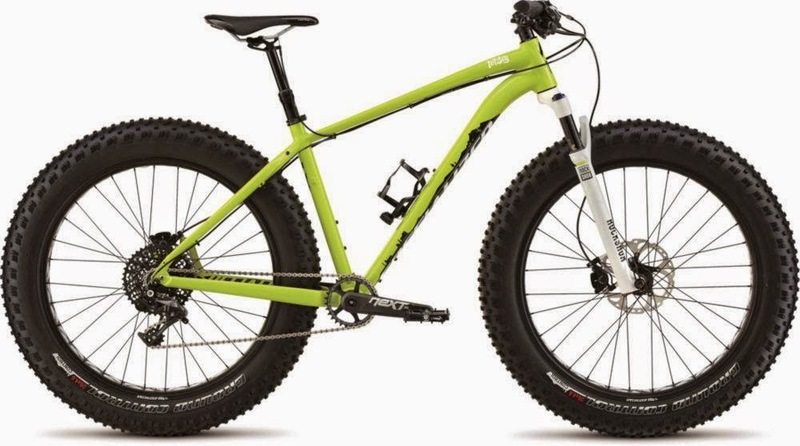 Okay, so that spurred my desires for a fat bike, which I got the following year, but I still wasn't 100% turned on to wider than 35mm rims for 29"ers. I figured 35mm was about the limit for me. Then the nutters at Surly made that Krampus thing, and I rode one. Whoa! That was a game changer right there. Not so much for the 29+ thing, but for a "mid-fat" 29"er option, which I saw as being a bit more possible with the right 29"er frame and fork. I was still not really all in, but then Velocity did something else with a wider rim, and made the Dually, which turned out to be different in that it was a rare, double wall extrusion at a very wide, (for a 29"er), width. The weight looked reasonable, so I got a set of these wheels. Ingawanis Woods are really canopied over now. I had a bit of a time window open up on Fathers Day yesterday to squeeze in a ride at Ingawanis Woods. So, I loaded up the Singular Cycles Buzzard and headed up. It was sunny, humid, and quite breezy. It was supposed to be raining with possible severe thunderstorms, so I wasn't complaining! When I arrived, it was apparent that even if it had rained recently here, it didn't phase the trails one bit. In fact, I would guess that it didn't rain up there at all, since the trails were rock hard dirt. That and the fact that they had been recently groomed meant it probably would be fast. Turns out that this was spot on. I was flyin'! The trails up here are always interesting in a good year with decent moisture. That gives the trees a lot to work with and since this little patch of land has been wooded for a long time, the canopy is pretty thick. I remember before the logging up there several years ago that you could ride when it was raining lightly and never get wet in the middle of Summer! Since the logging, it hasn't been as spectacularly dark under the trees until this year. I've noticed that in spots it is back to the usual near night time-like darkness, especially when the Sun goes behind a cloud. There still is a ways to go before it will be like "the old days"! The Eagles weren't around today, but it was a beautiful scene anyway. The "Bottoms" have dried up now so that they are rideable again, so I went down through there for the first time since late last Fall. I had to stop to see if the Eagles were home at my usual viewing point, but they were no where to be seen yesterday. It was okay though, as I love to take in that view whenever I get the chance. So, Project LTHT is really shaping up to be a great bike. The new fork is really tweakable. I was messing around with some different settings and found that you can turn it into just about anything you want, feel-wise. I could make it fairly stiff, and have it sit up into its travel, or I could make it plush and super smooth, or anywhere in between. The seated position, which I never liked with the Diamondback Mason, is really very nice on the Buzzard. It climbs just fine if you use an "active" climbing style and don't just sit there in one spot on the saddle. The gearing is low enough for anything around here. The wheels and tires are phenomenal on this rig. Call them "mid-fat", I guess, but the On One tires are huge on the Dually rims and these might be the best tubeless combination I've yet tried. I pump the tires up and they literally go several weeks before needing topped off again. The "strobe effect" was in full effect once again! There is always room for improvement though and this bicycle is no exception. For one thing, the sub-par Specialized dropper post is merely "okay" and sometimes sinks down a hair when seated over average bumps for a while. The weight of this bike is North of 30lbs as well, which isn't that big of a deal, but you always wish for "less" there, right? Typically I don't think about the weight of the Buzzard as it sits, but if I had long climbs over and over again, I would likely start to think about that. There are a couple of things I need to sort out as well, like just how to set up the SLX brakes to eek out a little better modulation, and then there is the aforementioned fork, which I have to dial in just right yet. More experimenting means more rides which should equal more fun. That's a good thing, right? Well, I do know that the ride yesterday was super fun, fast, and oddly enough, easy. The legs and lungs were working really well, which I was a bit surprised at due to my somewhat sporadic training of late. I'll take it. Hopefully I feel as good at Odin's Revenge. I decided to take my son out on a bicycling adventure Saturday, because the forecast for Sunday didn't look too promising. We had a good ride and my son learned a few things, so that's always a good thing. Here's to you, if you are a Father. I hope the day brings you good things. Thanks for being the best Dad you can be. It matters a lot. Here's to you if you aren't a father. There is no shame in not having your own children. And just like above, that doesn't mean you can't be a "father" to someone. Whatever the flavor, have a great Father's Day and enjoy yourselves out there! It took a while to chase down the part, but we did and I have the "bolts" and "Nuts" in hand now. In fact, I just got them home last night and have not installed them as of yet, but they should resolve the aesthetic complaints I had with the 46T ring swap with the original 52 tooth ring. I definitely am still flabbergasted and dismayed at how much this aluminum and composite composition costs though. It's a flat out crime for a set of fasteners. Eight bits of metal and composite material. Okay, hold on to your hats folks, because I'm going to give you the retail prices for the 46T chain ring and the 4 bolts and 4 special beauty "nuts" that make the ring and arm work together aesthetically. Ready? Yes, really. Now- I will disclose that as a shop mechanic, I got a discount on these parts, and I paid with my own money for these. That said, this is what my Dad would describe as "highway robbery". It's incredible, and I just don't see where you get $241.00 of value here. I probably should just leave those old style "ugly" steel chain ring bolts on there in protest! Oh well, I decided to do it "the right way", but I am going to have a real hard time justifying this in the end, and on a rig that probably will eat that ring up by this time next year, given the amount of dust it will see. The chain ring isn't all that special. It has some machining, and Shimano's typical ramps and pins, but really- the MSRP on this ring alone is $190.00. That's price gouging, and when you check on-line, you'll see similar, but older series Shimano rings, running for way less than $100.00 MSRP, not to mention how much they are discounted now. The "beauty bits" that make up the four chain ring fasteners should be included with the 46T chain ring! The fact that they are not is not only outlandish, but shows Shimano's lack of detail in marketing and lack of concern for how their products are perceived by end users. I mean, I could just leave the ring as is without the proper bits, and have it remain very ugly, instead of a complete looking product that is still ugly. Not having the chain ring fasteners be sold along with the chain ring just smacks of more aggressive marketing without concern for value. The original 52 tooth ring for this crank is a marvel of technology. It has this aluminum "skin" over a composite core and the female part of the fasteners are embedded right into that ring. Had the new, 46T ring been the same way and cost $241.00, I could have forgiven the price. Well, more so than for what I have here, which is an imposter of the 52T ring's "better" technology. While it will look the same, it ain't the same! I'll not just complain, but I'll offer this solution for Shimano: Obviously, the bits for the fasteners need to be sold with the chain ring, not as a separate product. Next, this product, at best, is a $60.00 ring with the bolts and nuts. Finally, do we really need a crank that integrates the chain rings into the arms? That's about it! End of rant. Next time I talk about this will be when I do a final take on the set up once I wear it out, which hopefully won't be for quite a while! TIMP: A couple of Trans Iowa notes to kick things off here. First off, I have received word of another scheduled attempt at the route. This time its "ITT" style. "What's that? ", you ask. Well, it means that this attempt will be done completely solo, and as fast as possible- "Individual Time Trial", or ITT for short. The individual in question is Trans Iowa V9 and V10 finisher Steve Fuller. 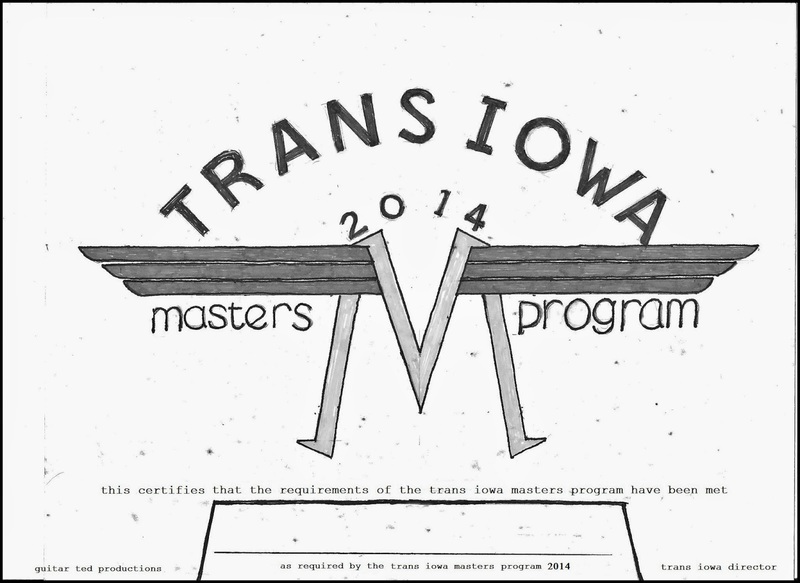 You can check out more about the Trans Iowa Masters Program here. I also found out a story about the first two TIMP finishers is out now. You can check out the story of Andy Zeiner and Scott Sumpter's TIMP ride here. The next thing having to do with Trans Iowa are a couple of things, actually! Both are posts about the event. First is a great read by Charlie Farrow, who won the "Grittiest Ride Award" for this past Trans Iowa. You can read his thoughts about "nerd-do-wells, bohemians, and misfits" HERE. 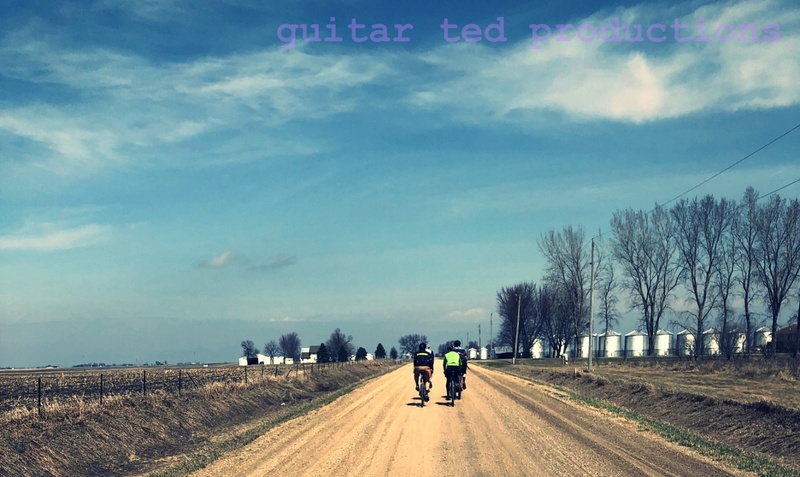 Actually, that's the third entry about this past Trans Iowa by Charlie, so you can scroll down his page and catch the rest, should you want to. I saw the other day where SOMA is going to offer a new fat bike. SOMA? You can think of them as kind of a cross between Portland Oregon, Surly, and Velo Orange with a little bit of All City thrown in as well. They've been around awhile, and were known in 29"er circles early on for their "Juice" model. Anyway- looks like this is an offset frame at this time, however, since there is going to be a 170mm Rohloff hub available soon, that may change, since SOMA seems bent on making this frame IGH compatible with a Rohloff 14 speed internally geared hub. Other details known now are that SOMA feels the geometry is best for "bombing down hills" so that suggests a trail bike instead of a soft conditions bike, but obviously one could use it as a soft conditions bike. 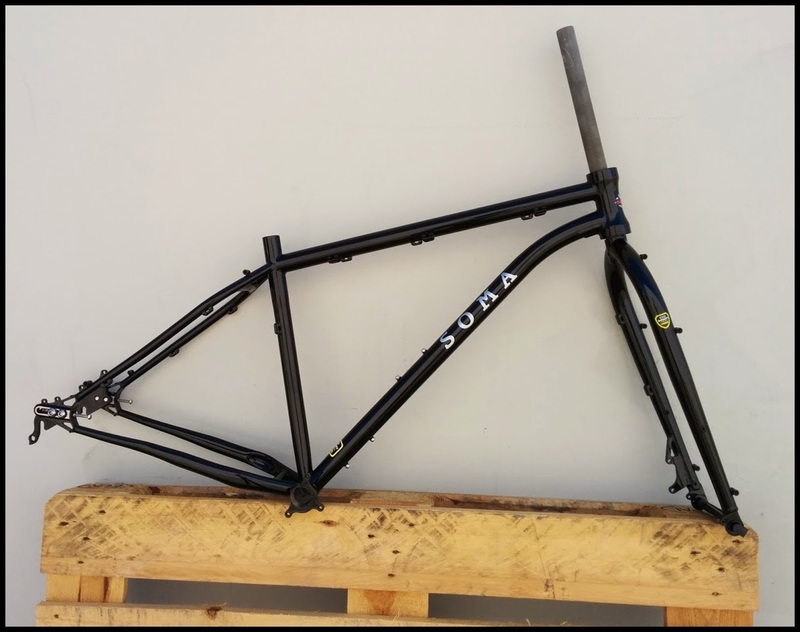 SOMA seems to indicate that solid details about the rig won't be available for several months, but it will be an interesting alternative to the mostly aluminum frame offerings out there now. Okay, that's all for this edition. I hope all the Fathers out there have a fantastic weekend and that ya'all have a good weekend on the bicycle. The test of the brake went well. No rubbing, no noise, and consistent, good braking power. Essentially, it is just like new, but I will switch back to the Ashima rotor I was going to use. It's got the same level of performance, but it is lighter. I loaded up the Bike Bag Dude Chaff bags and custom frame bag with most everything I think I'll pack for Odin's Revenge. The only thing I didn't have on board was food, but I did pack four full water bottles and a external battery LED light. I also had two tubes, a multi-tool, and a mini pump. There was a packable rain jacket in there, but I had no fear of needing that on such a beautiful day. There is a first aid kit and wet wipes as well. I think that's about it. Basically everything but the food. The purpose of this ride was twofold- One reason was to determine if not having a bigger than 32 tooth ring on the crank was going to be an issue, and the other was to see how the GEAX AKA 2,2"ers would deal with powdery dirt, which I have been informed that the Odin's course is capable of having a lot of. There was only one good option to find out both things- A trip out to Petrie Road and the mile of B Level Maintenance road out there. Plenty of "cocoa powder" and sandy dirt ahead! So I headed out that direction via the Sergeant Road bike path until I could hop off onto gravel at Aker Road and start checking out how the bike would do on gravel. I may have ridden the Muk in this configuration on gravel before, but I can't recollect when or how that went if I had done it. Basically, this was news to me with the 29"er hoops in the frame. As you might expect, it wasn't bad at all. The frame is compliant, the titanium seat post is wonderful, and the tubeless GEAX AKA's are soaking up vibrations as well. I noticed how the slacker head angle and long wheel base were working to keep the bike from chattering sideways on the fresher gravel. Stability. I'd be needing that on the fast, ripping descents that the Odin's course will likely have. The bonus find of the ride was that the B Level maintenance portion of Petrie Road did indeed have deep, powdery dirt. Just what I wanted to find. While a true fat bike 3.8"er would have scoffed at this pile of dusty dirt and rode rough shod over it, I wasn't sure that the "skinny" AKA's would hold up. I believe that they did as well as they did due to the stretched wheel base and stable geometry of the Mukluk. I could change lines, and the wheels didn't want to instantly wash out. Nice! Barns For Jason- When was the last time you saw a load of "square" bales? I had an issue with the bike though. I heard a strange rattle in the back and I tracked it down to a loose cassette. The lock ring appeared to be tight, so perhaps I forgot that stupid shim that 10 speed cassettes are supposed to have behind them on the free hub body. Meh! I think Shimano does the best overall with cycling components, but sometimes the tiny details are just stupid or maddening or both. Really- you couldn't have just made the base of the largest cog a little wider? Lame. No excuses though- I missed that spacer and that's on me. I'd get that after I got home and it was better to find out now rather than at Odin's! On the way home, I pretty much put myself into single speed mode so as not to exacerbate the issue. While nursing things along, I saw something I didn't take notice of at first, because in the depths of my memory, what I was seeing was normal. Then I realized that it was actually really an odd sight. A load of freshly baled "square" bales of hay on an old style hay rack. In a day where the round bales of hay have taken over, seeing this brought back many memories of helping relatives on farms bale hay in the hot Summer Sun. It was a fantastic day out on the bike. Sunny, a nice breeze, and dusty gravel roads. It doesn't get much better than that! With my test ride the other night of the titanium Mukluk set up for Odin's Revenge, I noted that the front brake was rubbing and making noise. No big deal, I probably just needed to recenter the caliper, right? Wait a minute there, Podner! it was more complicated than that! Apparently fat biking on wintry city streets has its downsides, namely corrosion. I found a few washers were broken. Those "CPS" style concave/convex dealies? Those were broken and badly corroded. I replaced all the broken and suspect ones and tried again. No go! Still rubbing. Upon further inspection, I noted that one pad was not moving. Yep! A stuck piston. Great! I did some online research. (It is the "information super-highway", after all!) I found out how to treat the problem and then I found out my pads were shot. Dang! Stopped again. I ordered a new set of pads which showed up yesterday and I continued to move forward again with repairs. Hopefully it would be a simple fix. I didn't have the proper brake block! In the meantime, I had bled the brake, since it had not ever been done since the bike was built up. I happen to have the proper bleed kit and a fresh bottle of DOT5 fluid which I used to purge a bit of air from the system. After I was satisfied that I had all the air out, I looked for an Elixir 9 brake block in my kit, but I didn't have one! So, I fashioned a wine bottle cork to do what I needed and that worked really well. It was better! Much better. I centered the caliper and tightened everything down. It should be good to go. The lever feels the same as the rear brake again, and there should be no noise. I'll know for sure later today. This just raises awareness on my part for maintenance of fat bikes. If you go for the more demanding aspects of fat biking- snow, mud, and Winter streets treated with chemicals, you'll need to pay attention to corrosion and its affects upon your hardware. Fortunately my issues did not impact a big ride or cause a crash or injuries, but the damage could have, so I was fortunate to catch all this before it went pear shaped.